Profile: Eagle Eye is a devious Decepticon whose penchant for dishonesty is legendary. He tells a different lie to every robot he interacts with and somehow manages to keep track of every single one. Not even the other Decepticons are spared from his vicious brand of manipulation. Unscrupulous and cunning, Eagle Eye is dangerous to cross and impossible to trust. In fact, the only thing he can said to be genuinely honest about is his loathing for the Autobots. His considerable venom for them represents a hatred of a whole new caliber, and he takes advantage of any opportunity afforded him to smash them on first sight. Abilities: Eagle Eye was named so for his legendary visual acuity. He has the most sophisticated optic sensors of all the Decepticons. He can read the license plate of a car from a stratospheric altitude of 40 miles. He possesses full-spectrum vision, enabling him to see in infrared, ultraviolet, and in pitch darkness. He can even read light waves, and cannot be fooled by cloaking devices or holographic projections. 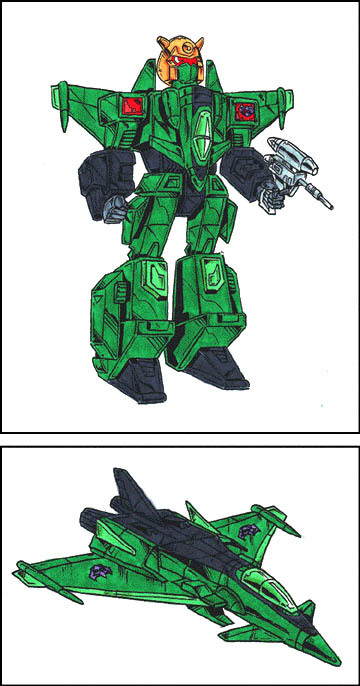 In plane mode, he is equipped with an undercarriage radar targeting system; it detaches to form a separate weapon for use in robot mode, which he uses to attack with deadly accuracy. Weaknesses: Eagle Eye tends to rely on his vision to the exclusion of his other senses. He frequently misses the point of conversations and is usually the last one to detect Autobot gas fumes, if at all.